I am so exhausted, but I pulled this one out. 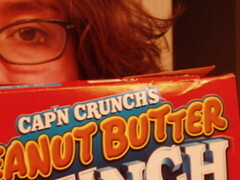 I actually took this last night and didn’t like any of my cap’n crunch pictures. But after I got home, I decided that there were some interesting ones that I was, I guess, too tired to judge positively. I enjoy Cap’n Crunch. I don’t eat it all the time…I jump between cereals, but I always come back to it. As a kid, it was always my favorite. oooh, the cap’n. he and i go way back. love the pic. Ooo, still remember my first bite of Peanut Butter Captain Crunch – yum! Of course, I don’t eat it anymore. Just watch the husband and oldest child gobble it up, they can’t eat it often enough! I still remember how torn up the roof of my mouth would be when I’d go visit my dad and he’d get me cap’n crunch, peanut butter.